Mercedes Benz-Stadium has almost all of its concrete bowl complete now, with 1,400 people working on the site daily. But the part everyone’s waiting for is its stunning dome with 8 petals able to close within 7 minutes. The flower-shaped structure will be one of a kind worldwide, which is part of the reason for the stadium to be delayed. Design work on this challenging steel structure and immense panoramic screen hovering beneath it is taking longer than anticipated. At present the stadium has 3 months of delay, as was revealed by Arthur Blank, owner of Atlanta Falcons. The businessman talked to The Atlanta Journal-Constitution and confirmed changes in schedule had to be introduced. Current opening date is pushed to June of 2017. If there’s no further delay, it changes very little for the arena’s main tenant, the Atlanta Falcons. Their season begins in late summer, but it’s a different story for Atlanta United. The soccer team are to join MLS from March 2017 onwards and are still hoping to play all 17 home fixtures at the grand stadium. This would force changing the calendar for them to play 3 months of away games only. Should that not be possible, there will be an alternative temporary stadium prepared, Blank assured. Delay in construction will also affect the stadium budget. 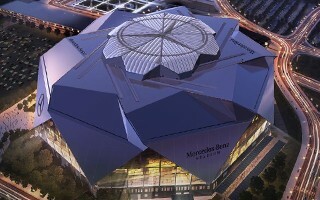 Currently expected to be at $1.4 billion, it might inflate further and possibly even make Mercedes-Benz Stadium the world’s most expensive. Or at least until the Inglewood stadium gets done. Details as to final price will be known after further evaluation.